How does asthma affect buying life insurance? Asthma is a fairly common health issue; more than 22 million Americans are asthmatic. Because of this relatively high number, we can assume that many individuals who apply for life insurance mention this condition on their application. While having asthma may affect your life insurance premium costs, it surely does not mean you can’t get life insurance. Life insurance companies follow their own underwriting guidelines. This means that each company will rate a certain condition differently. While one company may decide to give an applicant a Preferred Plus rating for a certain condition, another company may offer only Standard. This is where Quotacy can help you. We have relationships with many of the best life insurance companies and know the idiosyncrasies of each. Once we know your unique situation, we will shop your case at the appropriate insurance companies to help you get the best possible coverage. Asthma is a chronic inflammatory disorder of the airways characterized by episodes of reversible airflow obstruction and manifest by symptoms that may include coughing, wheezing, difficulty breathing and chest tightness. The cause of asthma, while unknown, is felt to involve an interaction of genetic and environmental factors, and rather than being a homogeneous disorder, different types of asthma are felt to exist. While asthma may commence at any age, most are diagnosed during childhood. Diagnosis is made based upon history, physical examination, and pulmonary function testing, although specialized testing called a methacholine challenge is occasionally performed when the diagnosis is evasive. Asthma can essentially be divided into two categories, based on how it is triggered. Extrinsic – asthma that is triggered by an allergic reaction. Intristic – asthma that is triggered by factors other than allergies such as anxiety, stress, exercise, cold air, dry air, hyperventilation, smoke, viruses or other irritants. Other than the “type,” asthma also gets categorized based on the severity of your condition. There are four categories of asthma severity. Severity is based upon a number of variables, including the frequency of symptoms, presence of nighttime awakenings, use of short acting medications for symptom control, and interference with normal activity and lung function. It is possible for the severity class to change over time. For life insurance, the underwriting of asthma takes into account several variables, including severity, overall control, compliance with prescribed medications and medical appointments, the number of exacerbations, and the need for short acting medications and oral corticosteroids. The chart below is an example of how a life insurance company may classify the severity of an applicant’s asthma. When you apply for life insurance, underwriters review the complete application and all the records that go along with it. They then decide how much coverage and at what cost to offer the applicant, unless they decide to deny or post-pone the application. For applicants with asthma, you can be classified anywhere between the best rating of Preferred Plus to being table rated. 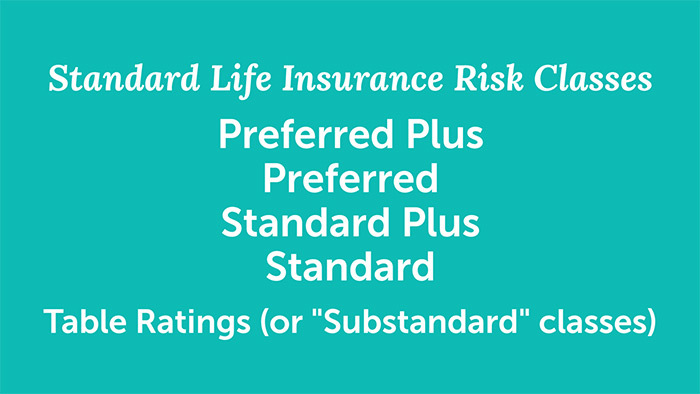 The table rating system typically means that your pricing for life insurance will be the Standard price plus 25% for every step down the table you are. Tables descend A-J or 1-10 depending on which format the insurance company uses. We’ll take a look at an example applicant and breakdown what their pricing may be depending upon their rating. John Doe is a 35-year-old male who was diagnosed with asthma as a child. Depending upon the severity of his asthma, tobacco use, and if there are any other issues that the underwriters may consider a risk, the chart below can be used as an estimate of his monthly payments were he to buy a 30-year, $150,000 term life insurance policy. If he is an extremely healthy individual with no negative family health history, and his only issue was mild, well-controlled, asthma, there is a chance an insurance company would offer him the best rating of Preferred. In the world of life insurance, “Table A” is the same as “Table 1.” Companies use one or the other. For the example below, we’ll go with the numerical Tables. A benefit to working with Quotacy is that we work with multiple A-rated life insurance companies. We’ll shop your case to find the best policy option for you. Quotacy has years of experience getting clients life insurance coverage, including asthmatics. 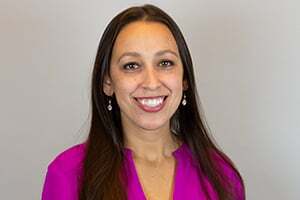 Our in-house underwriter has worked in many carrier home offices, knows how to navigate each individual’s health history, and knows which life insurance company would be the best option for your individual case. If you are ready to buy life insurance coverage, get a term life insurance quote now and let’s start the process. If you have any questions regarding underwriting asthma, feel free to contact us or jot us a message in the Comment section below. If you are looking to get an idea on the cost of life insurance if you have asthma, we will need the following information to provide you with an accurate quote. Have you ever been hospitalized for this condition? If so, please give details. How many episodes of asthma have you had in the past year that required you to go to the ER or see your physician for treatment? Have you ever smoked? If so, how many cigarettes per day? If a former smoker, on what date did you quit? Are you on any medications (include inhalers and any medications taken on an “as needed” basis)? If yes, please give details. Have pulmonary function tests (a breathing test) ever been done? If so, what were the most recent test results? Do you have abnormalities on an ECG or x-ray? If so, please give details. Do you have any other major health problems (ex. Heart disease, etc.)? If so, please give details. Today, we’re talking about asthma and the impact it has on the life insurance buying process. Asthma is a very common medical condition. While having asthma may affect your life insurance costs it doesn’t mean you can’t be approved for coverage. The main things life insurance underwriters look for when evaluating asthma are what medications you’re on to treat it and how often you have asthma attacks. In general, if the medication you’re on does not contain steroids you could qualify for standard risk classes. If it does contain steroids then you’re more likely to be table rated. Being table rated means that the insurance company has decided that the risk to insure you is essentially outside of their comfort zone and you will need to pay extra in order to be insured. 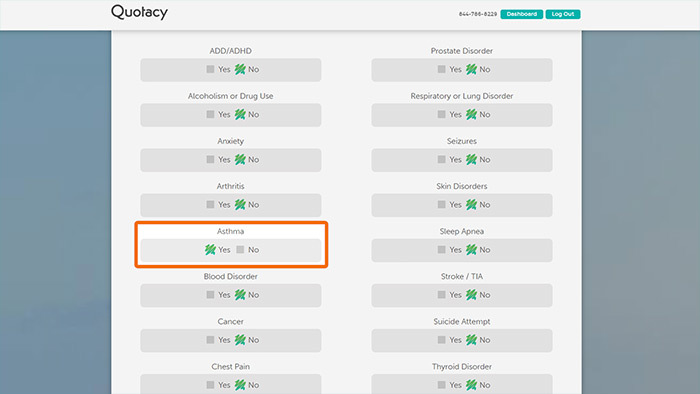 If your asthma is very mild and it’s well controlled it’s possible to get approved for Preferred, however, the best class of Preferred Plus is fairly unlikely. The risk class you’re placed into by the insurance company determines how much you’ll need to pay for the life insurance coverage. 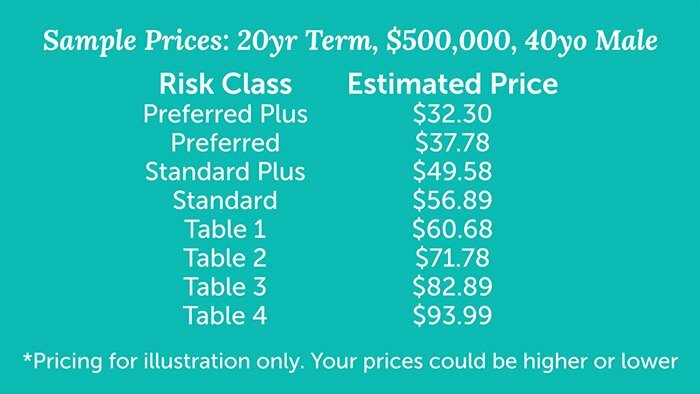 The table shown features sample monthly quotes for a 20-year, $500,000 term life insurance policy for a 40-year-old male. As you can see, the risk class you’re offered can make quite the difference. Not all life insurance companies evaluate medical conditions in the same way. While one company may deem a person with mild asthma as Table 2, another may be more lenient and offer Standard. To make sure you get the best price work with an independent life insurance broker like Quotacy. We can shop your case across many top-rated life insurance companies to match you with the company that will give you the best risk class. Quotacy is no stranger to asthmatic clients. When you apply online for life insurance through us and check Yes to asthma your Quotacy agent goes to work for you to find the best policy for your needs and budget. Nick Jones is a 35-year-old man and applied for a 30-year, $300,000 term life insurance policy through Quotacy. His Quotacy agent suggested they move his application to Prudential, who is much more lenient with asthma. 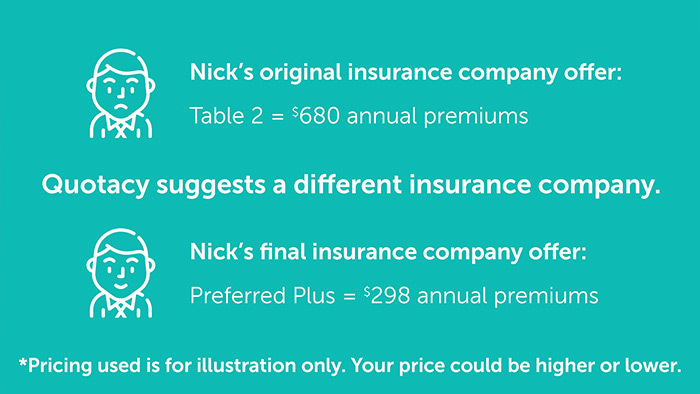 Nick went with his agent’s suggestion and Prudential ended up offering him the best risk class possible: Preferred Plus. His life insurance payment ended up only being $289 annually. A savings of over $380 each year. It’s important to note that every case is different. 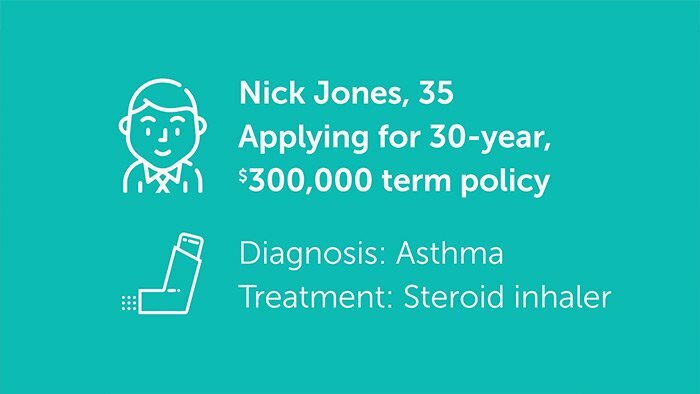 If you have asthma, don’t assume Nick’s outcome will be your outcome. Every asthma case is unique. Also, asthma isn’t the only risk factor that the life insurance company will evaluate. Your age, height, weight, smoking status, family health history, etc. will also impact your risk class. At Quotacy, your agent will anonymously shop the details of your case with all the top-rated insurance companies we work with to match you with the company that will give you the best offer. As we mentioned before, everyone’s situation is unique. To determine how much life insurance will cost you simply apply online through our website and we will work with you to find you the best policy option. When you apply through Quotacy, this is how it works. First, choose a policy and complete your online application. Then your dedicated Quotacy agent will introduce themselves and, if needed, ask a few follow-up questions about your asthma via email. This is to make sure we have a clear understanding of your situation so we can set realistic expectations up front. It’s important to mention that we’re on your side So the more we know, the better we can assist you. From there your agent will anonymously send the details you’ve provided to our top-rated insurance companies to find the one that will be the best match. This is what we call shopping your case. If a different insurance company other than the one you chose online is going to give you a better price your agent will present you some options. The choice to either stay with the original pick or switch is 100% up to you. We just want to be completely transparent about your options. Whatever you decide, your agent is your advocate and will keep you updated every step of the way through the process. If there is a website out there showing you a cheaper price than what your Quotacy agent can find, that other website is likely only showing you a best-case-scenario price and not factoring in your asthma properly. There are no coupons or promo codes when it comes to life insurance. It’s all very tightly regulated. To find out how much life insurance would cost you, head on over to Quotacy.com, run a quote, and apply right online. It takes less than 5 minutes and there’s no obligation to buy. If you aren’t satisfied with the life insurance policy Quotacy finds you, you can walk away. There’s no cost to apply for life insurance, no fee to cancel the process, and no hard feelings.